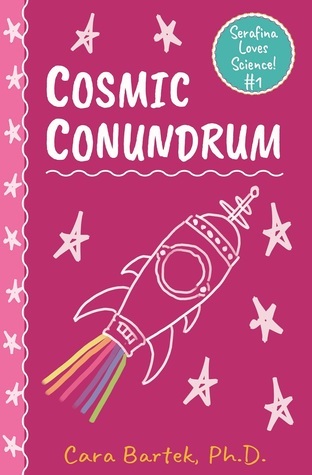 Serafina Loves Science: Cosmic Conundrum by Cara Bartek, Ph.D.
Summary: In Cosmic Conundrum, sixth grader Serafina Sterling finds herself accepted into the Ivy League of space adventures for commercial astronauts, where she’ll study with Jeronimo Musgrave, a famous and flamboyant scientist who brought jet-engine minivans to the suburbs. Unfortunately, Serafina also meets Ida Hammer, a 12-year-old superstar of science who has her own theorem, a Nobel-Prize-winning mother, impeccable fashion sense—and a million social media followers. Basically, she’s everything Serafina’s not. Or so Serafina thinks. Even in an anti-gravity chamber, Serafina realizes surviving junior astronaut training will take more than just a thorough understanding of Newton’s Laws. She’ll have to conquer her fear of public speaking, stick to the rules, and overcome the antics of Ida. How will Serafina survive this cosmic conundrum? About the Author: Cara Bartek, Ph.D. lives in Texas with her husband and two daughters. The Serafina Loves Science! series was inspired in part by her career path and in part by her two little girls. Her hope is to make this world a more equitable and opportune place for her daughters one silly story at a time. Visit www.carabartek.com. Also, stop by on Sunday for an author guest post by Cara Bartek including information about the second book in the series! Review: Serafina is a genius. And eleven. Both things that can cause strife which leads us to her story. At its heart, it is a story of an eleven year old navigating a new situation and a new bully with the help of her friends and brains. At its brains, it is a story of a genius young woman who wants to do amazing things with her life and uses her brains in ways that are unexpected and important. Combined, you get a wonderful middle grade story that shows how interesting science can be and how important it is to just be yourself! I am looking forward to reading the second book in the series and getting both for my classroom. Teachers’ Tools for Navigation: First, the book belongs in libraries so that kids can read them. 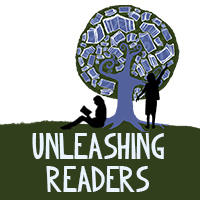 So many readers are going to enjoy Serafina: your realistic fiction readers who love to read about school and other things they relate to, your science fans, ya=our sci-fi fans who want to think about inventions for the future. It is definitely going to find some readers! As a cross-curricular text, one way it could be used is to use it to examine science. The back matter of the book shares the science behind much of the book in a “blog post” by Serafina about Newton’s Laws of Motion. While still being told in the voice of Serafina, the blog post is filled with information about all three laws. This blog would be a great place to start then as students read the book, they can look for times when these laws were in effect and also connect them to real life. Why was Serafina’s invention so different than everyone else’s? How does friendship play a role in Serafina’s story? How does the zero gravity plane work? What does the story say about money and influence versus brains and hard work? How did Newton’s Laws of Motion fit into the story? What do you think is going to happen in the next Serafina story? Six months earlier, Jeronimo had issued an open call to all scientists under the age of 13 to apply for 50 open spots for a grueling scientific competition to see who could earn a coveted spot in his junior astronaut development program. The application had been killer. Wannabe commercial astronauts had to submit notarized transcripts; a 10-page autobiography complete with philosophical stances on such topics as politics, the environment, and the role of the Kardashian family in modern society; a DNA sample; a fully executed last will and testament; and an original working invention designed to make space travel more bearable. One Response to Serafina Loves Science: Cosmic Conundrum by Cara Bartek, Ph.D.